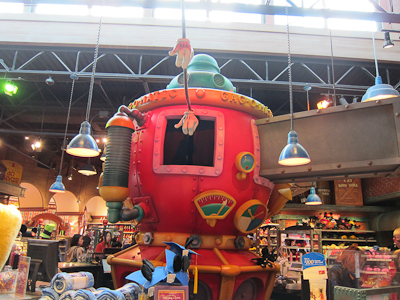 If you’re so bummed you can’t ride the Jolly Trolley that you need some retail therapy–fear not! 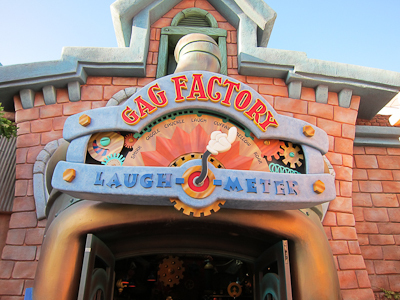 Right here in Toontown there’s the Five & Dime and Gag Factory. 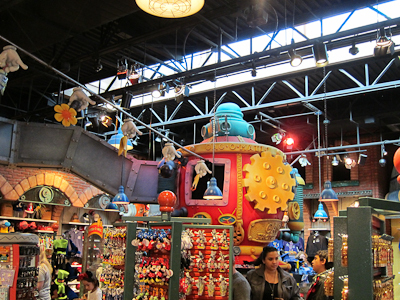 If you are feeling the shopping bug and it has to be in Toontown, you better do it here because it’s your only Toontown option. I’ll be honest here. I’m not sure where the Five & Dime ends and the Gag Factory begins. So that’s the other reason why you’re getting a double post. It’s a MYWTM Twofer! I have to say, I love seeing little girls in Minnie outfits. 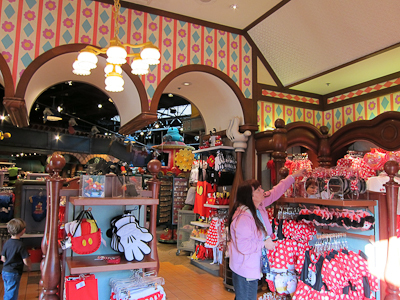 And I love seeing Mickey merchandise too. I mean, it’s not that I don’t love the princesses, or pink, or a combination of princesses and pink, but they get to be a bit…much. So I always appreciate a little Minnie running around. And if not Minnie, then Snow White. Oh! And little boys in Peter Pan costumes! LOVE!!!!! I think everyone should get into the dress-up thing. And by everyone I mean children under 10. But you know? Not sure. Hopefully some Sharp-Eyed Reader will chime in here. 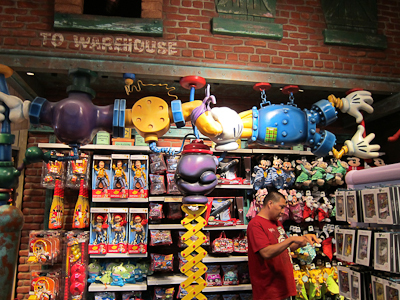 I can say for sure that this part of the store is the Gag Factory. Know how I know? Because it says “Gag Factory” on that big red machine thingy. My powers of perception are unrivaled, except when they're rivaled. 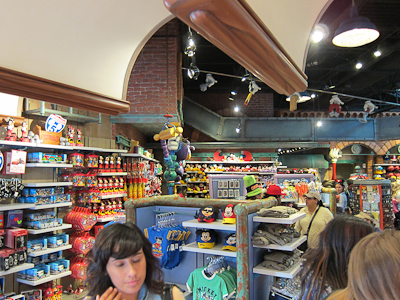 In one section, they used to have a “make your own mouse ears” station. It was actually really cool. You picked a hat, snapped on the ears of your choice, added various decorations, and so on. And then they took it away. I’m not really sure why. It always seemed pretty popular when I was there. 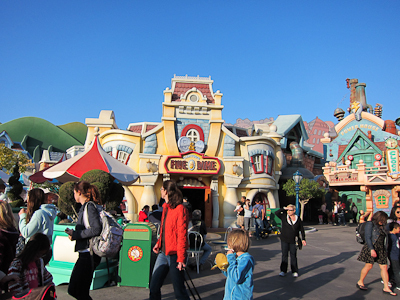 Anyway, because it’s in Toontown, the theming is pervasive. Yes, spellcheck. Themistocles, the Athenian politician and general, was exactly what I was shooting for. Thank you!!! Fun theming! And by theming I mean Themistocles! Boiler thingy, and by thingy I mean Themistocles. There’s also the hat writing stations, and here’s another one of my Disneyland sad stories, the old hat writers. 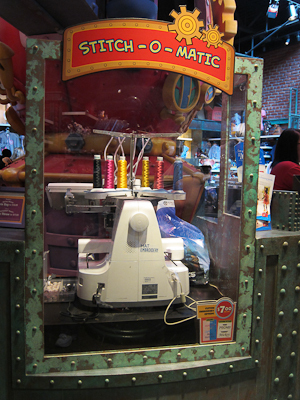 Once upon a time your hat was written on by a human muscling the hat through an insane sewing machine that looked and sounded like it would take your arm off if you weren’t careful (exaggeration–to my knowledge, the hat writing sewing machines were never a serious safety hazard. at least not to your arm). And the human had to write your name in the Disney script, backwards and inside-out. That, my friends, is a skill. Unfortunately, that went by the wayside when new hat writing machines were introduced. Now you can get the traditional Disney writing in a couple different thread colors, or you can get other premium fonts in different colors. This seems like progress except for the fact that it now takes for.ev.er. for the machine to finish. So my advice is that if you’re getting a hat written on, you go ahead and find a churro cart and grab a munchie while you wait for it. "Get comfy--this is going to take a while"
One bonus, though, is that it’s fun for little kids to watch the sewing as it goes! I’m kind of thinking I need a pair of Mickey ears embroidered with “Themistocles.” Yes?